The Broke and the Bookish : Kelly reviews "The Queen's Rivals" + giveaway! Jane Grey is known in history as the Nine Days Queen - she briefly held the throne of England between the time of her cousins Edward VI and Mary. There are countless books telling her story, but what about two other equally fascinating characters, her two sisters Katherine and Mary? They are often overlooked during this turbulent period of history. Interestingly, in The Queen's Rivals, Brandy Purdy chose to have Mary as the narrator. Mary was the youngest sister and was historically described as either a dwarf or a hunchback. In this story, she stopped growing at the age of five and is thus often overlooked or pushed to the back. Because of this, Mary offers the best view of all the events surrounding her tragic family. The Grey sisters, daughters of the Duchess of Suffolk, who is the daughter of Henry VIII's sister, are all very sympathetic characters. Yes, as is typical, Jane is painted as a prude and generally unlikable, and Katherine is seen as ditzy and naive, but they are so real. You really feel sorry for them as they are treated as pawns in games they really wanted no part of. Even though the sisters are completely different, they stuck together through everything. Each character, especially the sisters, had such a depth and the story was vividly brought to life. The book follows through to Jane's attempt for the throne and her consequent downfall, to Katherine's marriage and later demise, and as well as Mary's heartbreaking time as the only Grey left. None of the sisters had an easy life nor a happy ending. Mary holds nothing back, whether it be the tantrums thrown by Jane, the abuse given by her mother, or the unusual interests of her father. There was an entirely creepy undertone to the book that I'm finding hard to explain. It may be the difficult family the sisters had, the lack of anything positive really ever happening to them, or a jaded narrator, but I constantly felt queasy and like I was the one personally subjected to all this bad luck. It was discomforting to tell the truth, but really hit home as great writing and characterization. Overall, The Queen's Rivals struck me as a truly unique look at Jane Grey and the ascent of Queen Mary, making it a standout reading experience. GIVEAWAY: You have a chance to get a copy of The Queen's Rivals for yourself! Simply leave a comment below to enter, you have until August 3rd (U.S. only). A side note: The Queen's Rivals will be published in the UK this September as The Fallen Queen under the name Emily Purdy (confusing!) and of course, there's another cover comparison! I do like the UK one better. The stained glass background is quite pretty. I am so excited to read this one! I've read about Jane Grey and her sister, Katherine, before but never very much about Mary. I'm interested in learning more from her perspective. Thanks for the giveaway! Oh I would love to win this book and read it. 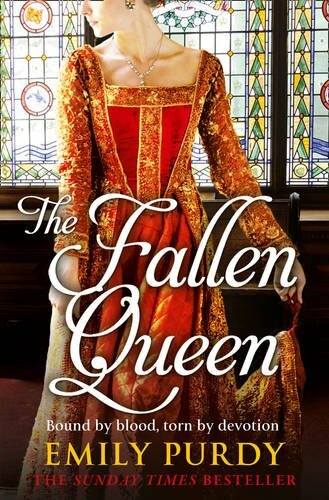 I do like the Fallen Queen cover as well (as well as the title). Thanks for the giveaway! I have been fascinated by the Grey sisters for a long time and I am looking forward to reading Brandy's take on their lives. Thanks for the great giveaway! More historical fiction recommendations! Love hearing about new books. this sounds super interesting! this book is now on my TBR list! Thanks for the opportunity to win it! This sounds fantastic! I've always been interested in the back stories of the Tudor relatives. There's such intrigue to be found in the minor royals. I love that your review states that this book had a creepy undertone that made you feel queasy. That's how I feel what I watch HBO or Showtime shows. I'd still rather know the ugly reality of history, though. This looks very cool. I love reading fictional accounts of the Tudors. This definitely on my list of "must read" this year - thanks for the giveaway! This is definitely on my list of "must read" this year - thanks for the giveaway! I love historical fiction, though I don't read enough of it. This review looks awesome. I think I like the US cover better, because it focuses on the Queen's rivals, not just one character. However, I agree that the stained glass on the UK cover is a pretty touch. Thank you for the chance to win this book. I am a fan of historical fiction. I am always interested in Tudor fiction-enter me please! I've been on a Tudor streak, would love to add this one. Would love to read this, it sounds like a very interesting take on the Grey family. Thanks for the opportunity. This sounds really good. I'm with you on the UK cover - much prettier. Sounds very interesting, and I just love historical fiction. I would really enjoy this one. Please enter me. Thanks! I haven't yet! I think Patrick Stewart is in it too? It's definitely on my to-watch list! Oh my goodness... This is one of the most awesome giveaways I have ever encountered. I am SO in love with this time period and historical fiction from this ear, you have no idea. I've been watching The White Queen and reading Alison Weir's Henry VIII and his six wives. I also just picked up The Wild Queen about Mary Queen of Scots. Jane is the only Queen of this time that I haven't read much on because there isn't a whole lot out there about her. I would love love love to read this one! It looks so incredible. And I think I agree, the UK cover is prettier :) Thanks for this awesome giveaway opportunity! Check back in a few days, I'll be having another giveaway for The White Princess by Philippa Gregory! I really need to check out The White Queen TV series as well. would love to read The Queen's Rivals!!! !